This is a tapas bar with the usual cold, hot and more substantial portions. 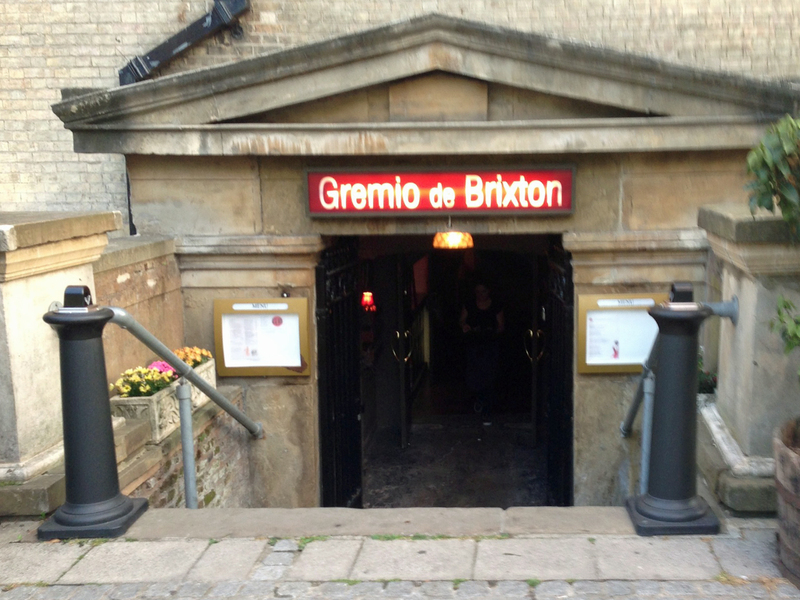 The menu is relatively short, so you are not spoilt for choice, but there are most of the Spanish favourites. Starters (para empezar), meat and cheese, salads (ensaladas) plus some dishes from the grill which are larger so more easily shared. The problem with this sort of approach is always to decide how many dishes to order, particularly if you are not a regular. 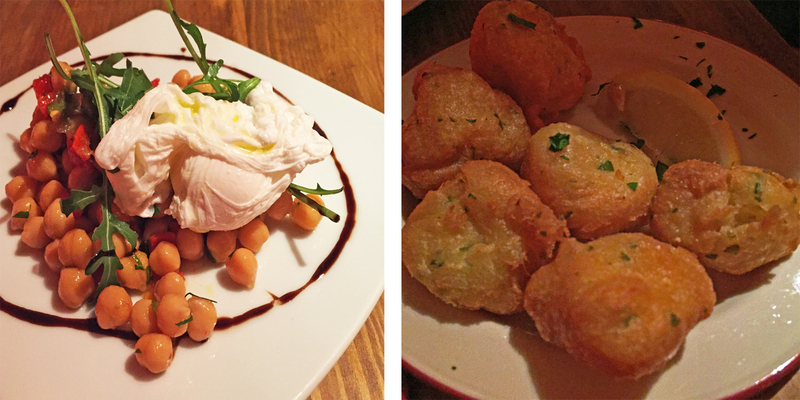 We started with Bunuelos de Bacalao – cod fritters with a sauce (which was good) and ensaladas de garbanzos – chick peas with smoked pepper and a poached egg (which was not so good). Both dishes were not really hot enough and we don’t really know who to blame for that – the waiter, the chef or the communication system. But we do blame the chef for the India rubber poached egg. This was unpleasant and no salt and pepper was available to make it more appealing — our waiter had disappeared so we couldn’t ask for any. Surprisingly the garbanzo salad was marked as vegetarian on the menu, despite the presence of the egg — very Spanish. We also ordered patatas bravas, which was a good-sized portion but, again, it was luke warm and the tomato sauce wasn’t sufficiently spicy to make it interesting. We needed some bread to mop up but our original waiter hadn’t asked and so we ordered later, at extra cost, when the food was delivered by someone else. The bread was good when it came. We then ordered a solomillo (listed as a portion for two) — steak with blue cheese sauce and some black pudding mash (a miniscule amount). This was better, although we weren’t asked how we wanted it and one end was overdone and the other just right. It hadn’t been rested so the blood mixed with the cheese sauce. We can definitely say we liked the blue cheese sauce. It was salty and highly flavoured. We had come to the end of a dry January without too many lapses, so ordered a sherry (manzanilla) and two glasses of wine (one white with the bacalao and one red with the solomillo). Although they only advertise wine by the glass starting at 175ml, I insisted on a 125ml glass of white wine. I can’t take too much in volume. The waiter said they didn’t have one but we insisted as it is the law. I was provided with a smaller glass of wine only to be charged for the larger size anyway – definitely another demerit. The whole meal for three small and one large tapas with three glasses of alcohol (small glass of wine remember) and some bread came to around £42.75. The food was promising enough, so we will return. But it will probably be any night except Saturday, so it will be less busy, in the hope that more attention will be given to the food and the customer’s needs. They do cater for parties and for finger food in the bar and perhaps that is how this restaurant should be enjoyed.